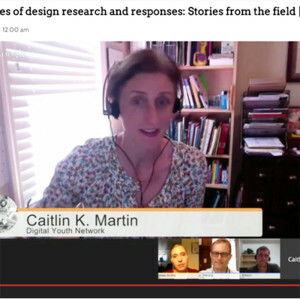 Cailtlin K. Martin is a Lead Researcher for Digital Youth Network. Since 2005 she has been studying DYN learning environments, looking at the impact and outcomes of participation in DYN opportunities for youth, adult educators, and local communities. Caitlin is a co-writer of the recent book about the Digital Youth Network, published by MIT Press, and has presented her work at conferences including Computer Supported Collaborative Learning, the European Association for Research on Learning and Instruction, and the International Conference on Computer Supported Education. For over 15 years, Caitlin’s work has concentrated broadly on the design, implementation, and study of environments that encourage youths from diverse communities to develop technological fluency. In the past few years, her work has increasingly focused on online participation within the networked communities, including DYN’s iRemix site. Specific themes include how to collect and look at log data in terms of learning, how to understand blended environments that use online environments within face-to-face programs, and how to design for more generative learning interactions between youth and educators. Caitlin holds an M.A. in Learning, Design, and Technology from Stanford University.